When placing a door in an opening, these doors must be fastened to the base material that is present in this location. Most frequently, this base material will be concrete, brick or block and will require the use of special concrete fasteners. Door frames may range from solid wood to hollow steel. Because of this wide range of possible materials, unique concrete fasteners may be required. These anchors may require features that are not commonly found in concrete fasteners. Often the thickness of the material to be fastened is larger than normal. Such is the case when using a hollow steel door frame. This application will require a longer than normal fastener to be used. Door frames may also require the use of a countersunk head anchor since the head of any fastener in a door-frame must not protrude into the opening. The two requirements described longer than the normal length and flat countersunk head- create a limited choice of effective concrete anchors for this application. 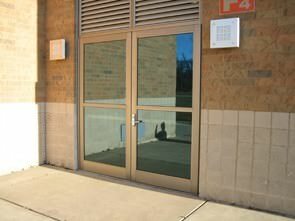 Standard metal doors are 1-3/4" thick, are manufactured from 16, 18 and 20-gauge steel and are galvannealed. Galvannealed steel is a process in which an extra tight coat of metal zinc is applied to a soft steel sheet and then passed through an oven at about 1200°F. This process creates a dull gray coating that is well-suited for painting. Wood door frames come in many different thicknesses and wood types. The exact specifications of the particular door frame being mounted will determine the length of the concrete fastener needed. It is important to remember that a flat countersunk head anchor must be used and sit flush with the outside surface of the door frame. Once the style and type of door that has been chosen, the base material of the opening in which the door will be placed must be determined. The base material will determine the type of fasteners that can used in that particular application. Most concrete fasteners are not available in a flat head countersunk head, this means that the selection for the correct anchor will be smaller than with most other applications. The sleeve anchor and Tapcon® concrete screw come standard with a flat head phillips countersunk head and are readily available. A female type anchor with a flat countersunk head can be used but are not recommended for this application because they are difficult to work with. Therefore, this article will not explore the use of this type of anchor. Sleeve anchors are very versatile concrete fasteners because they come in a wide range of lengths, head styles and diameters. Sleeve anchors are designed to be used in a variety of base materials including concrete, brick, and block. These anchors are available in four head styles: acorn, hex, round and flat head. A flat head sleeve anchor would work perfectly for fastening metal door frames to base materials. Sleeve anchors are manufactured for the hole size and the countersunk head type are designed into the door frame. The length of the anchor to be used will be determined by the thickness of the metal door frame plus the minimum embedment for a 3/8" sleeve anchor- which is 1-1/2". The 1st table below displays the holding values in concrete and the 2nd table describes the holding values in grout filled block. The only diameter of Tapcon® that comes in a 4", 5" or 6" length is the 1/4" diameter concrete screw. This is a smaller diameter than the sleeve anchor but is used by many door installers for this application. The flat countersunk head is large and fits nicely into the hole with a countersink manufacture into the metal door frame. Tapcons are perfect for wood frame doors because they are easy to use and make their own countersink in the wood as the screw is torqued into the base material. It is important to note that these concrete screws are threaded for a length of 1-3/4" from the point of the screw. This is because they require a depth of embedment into the base material of no more than 1-3/4" and a minimum embedment of 1". The 1st table below describes the holding values of Tapcons in concrete. The 2nd chart contains the holding values of concrete screws in the block. Both the sleeve anchor and Tapcon® allow door frames to be placed in position, leveled and plumbed before the anchor is inserted through the door frame. There is no prior spotting of the hole. Simply drill the hole in the base material with the door frame in place, insert the concrete anchor and tighten.